George Harrison’s fabulous musical legacy lives on in the band All Things Must Pass, fronted by Austrian-born jazz drummer Alex Eberhard. 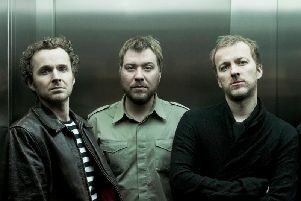 They play the United Services Club, Haywards Heath, on March 20 and Trading Boundaries, Sheffield Green, on May 15. The band has taken Alex away from his drumming and put him back on the guitar where he started. The triple album was a massive outpouring of Harrison music, much of it composed during his Beatles years. When he was 16, however, Alex trained classically and in jazz: “I became more or less a jazz drummer, but then really I just rediscovered my old love of George Harrison when I watched the Concert for George at the Royal Albert Hall in 2002, which was organised by Eric Clapton a year after George died. I watched the DVD, and it just blew me away seeing so many musicians sharing the stage. I thought I would love to do that, and obviously realised you couldn’t do it with a small band. I knew that it had to be a big band to do his work justice: three guitarists so the sweet slide guitar harmony parts can be played live; saxophone and trombone for all those lovely riffs; and two female vocalists in addition to a solid rhythm section. Most of the people are musicians I have worked with in the jazz world. Alex and the band spent a long time rehearsing before they started gigging, to be sure they were getting it right: “We did our first proper run of gigs last year. The plan is to take it into the theatre circuit nationwide and maybe even beyond. Call the United Services Club on 01444 455885 and Trading Boundaries on 01825 790200.